Last week the Thunderbird, the Woodfield Mall Cinemas and the Tradewinds Cinemas were discussed in chronological order. If we continue the same order, we begin now by visiting the Barrington Square Theaters. Opening on December 14, 1979 at the Barrington Square shopping center on Higgins Road, this theater was originally part of the AMC Theaters chain and was managed by Paul Kalas. It was the second six-screen theater to open in the Chicagoland area after the Ogden 6 Theaters in Naperville. The smallest theater sat 259 people and the largest 375. It was capable of showing the same movie in two adjoining theaters using the same copy of the film. The projector system was set up to run the same film with only a 30-second time lag between the two screens. Admission was $3 for adults and $1.50 for students and children. On opening day the feature films shown in the six theaters were: Skatetown U.S.A, Arabian Adventure, Alien, Breaking Away, The Fish That Saved Pittsburgh and Fiddler On The Roof. The Barrington Square 6 stayed in business 20 plus years, operating under the Classic Cinemas chain in the later years. When a new 30 screen theater opened in neighboring South Barrington in 2000, it spelled the end for the Barrington Square. The theater closed in October and was torn down a few months later as part of a redesign of the entire shopping center. In late 1991 a new theater operated by Cineplex Odeon opened at the brand new One Schaumburg Place Mall at the intersection of Higgins Road and Route 53. 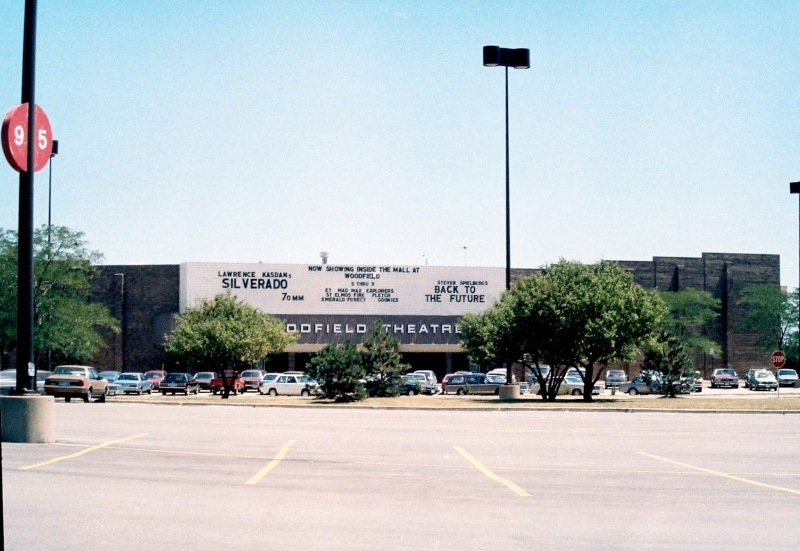 With only a few major tenants and a number of smaller stores, the theater was a big attraction for the mall. Even when Montgomery Ward, Phar-Mor and Filene’s Basement closed, the theater still managed to stay in business until 1997. 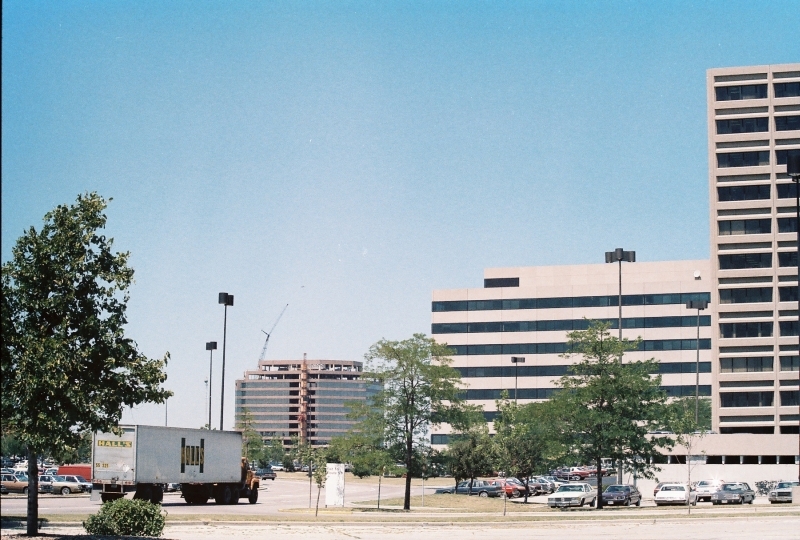 By 2000, One Schaumburg Place was completely reconstructed and a new shopping center called Streets of Woodfield took its place. With 20 screens in the AMC Loews theater and enough popular stores and restaurants as part of the complex, this is the one theater in Schaumburg Township still standing and operational. The style and design of each of the Schaumburg Township theaters may have been vastly different but they all provided pounds of popcorn, gallons of soda, boxes of candy and hours and hours of entertainment! 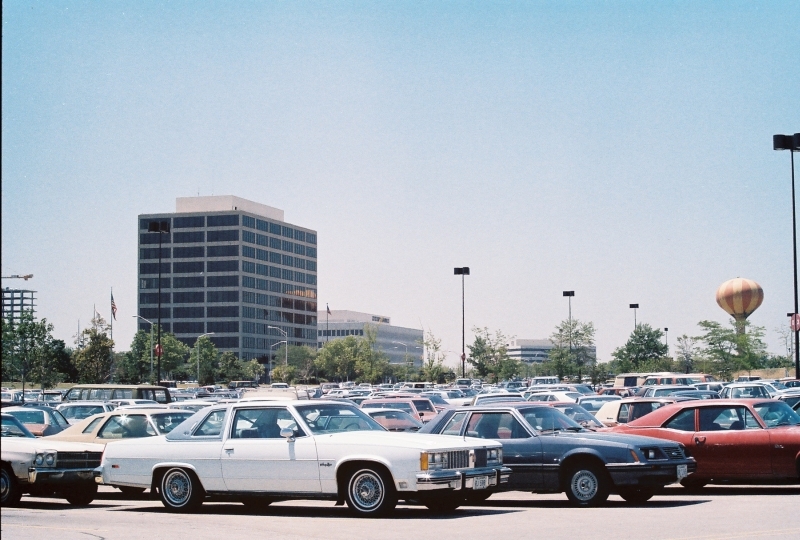 The 1980s and 1990s were the heyday of movie theaters in Schaumburg Township. At one time or another there were seven movie theaters in operation with most of them located on the outer boundaries of the township. The first one, though, was smack dab in the middle of the township in the Golf Rose Shopping Center on Roselle Road between Golf and Higgins. Having the neatest name of all, it was called the Thunderbird. The Thunderbird opened October 21, 1966 with 1200 seats. It had a 60-foot screen, 6-track sound and a courtyard lounge whose decor changed with the seasons. The theater lasted under that name until 1977. The Century opened in 1978 with three screens. The original theater was split in half and a third screen was added on. Later, the third screen was also split so that the theater held four screens. By 1986, the Century was surrounded by newer, larger theaters in the township and was forced to cut their prices and do business as a second-run theater. That experiment lasted a month and the theater was closed in November by its parent company, Essaness. Schaumburg really hit the jackpot when Plitt Theaters opened Woodfield Cinemas 1 and 2 on July 30, 1971, two months before Woodfield Mall opened. The opening shows were Scandalous John and A New Leaf. (Remember those hits? Me neither!) Cinema 1 sat up to 1075 people in comfortable rocking chairs and was a wonderful place to view blockbusters like Star Wars, Rocky and Twister. Both theaters had huge screens with 70 mm film features and Dolby stereo sound. Cinemas 3 and 4 followed eight years later in 1979 with less comfortable chairs and no 70 mm film features but, still, with the capability of seating many theater goers. In total, the theaters had 2875 seats. All four theaters came down in the late 1990s. Woodfield 3 and 4 were torn down on July 10, 1998. Woodfield 1 and 2 closed February 19, 1999 and were demolished shortly thereafter. They were replaced by free-standing strip malls and/or stores. In addition to the outdoor theaters, Woodfield Mall also had a theater in the mall called Woodfield Mall Cinemas. Owned by Cineplex Odeon, this theater replaced a skating rink and opened in 1985 as a five screen theater. They ran first-run movies for ten years and switched to second-run films in 1995. This theater closed in 2000 and was replaced by a theme restaurant called Mars 2112. It is now the home of the Improv Comedy Club. The third theater built in the township was in the far southwest area in the village of Hanover Park. It was the Tradewinds Cinemas I and II. They were built as twin theaters in 1973 as part of the Classic Cinemas chain and closed sometime between 2002 and 2005. The Tradewinds Shopping Center itself was demolished in February 2006. Do you have fond memories of these wonderful, old theaters? What favorite movies did you see? Were you one of those who saw Star Wars multiple times at Woodfield 1? 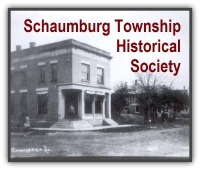 Be sure and share your memories–and check for next week’s blog posting on the rest of Schaumburg Township’s theaters.